ClydeNavalGazing correspondent Gordon Law bemoans the lack of available time ashore at Campbeltown on a Sunday as he sends this picture of Isle of Arran 01 September 2013. 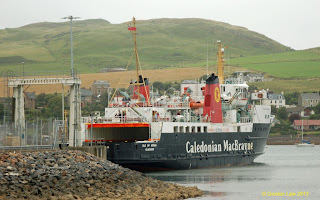 "One has to be an Olympic athlete to even get a record photograph at Campbeltown. I passed the test, eat your heart out Mr Bolt."